You know, today, I'm in the mood for some love. Not any of that other stuff. Good thing the Flannel Friday roundup today is the Valentine's Day Extravaganza! So I decided to share this little flannel love bugs. Because I need a hug. I ran out of googly eyes...so I used beads instead. Go with what you've got, right? 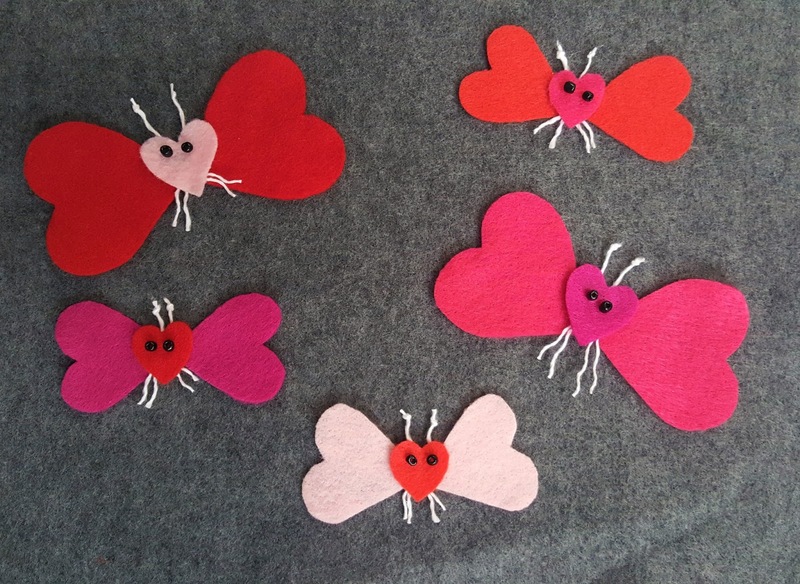 These five little love bugs can do all sorts of rhymes. See this video and this video for some inspiration. But here's an original composition, just for fun. This would be especially fun in baby time, or a lapsit program because not only do you get to practice counting, but you get to snuggle and hug (ooo! cuddles!). Which is just the bestest best, let's be honest. Were five little love bugs. ...repeat, counting down the number of love bugs. Aww, now I want to go find a love hug! Hope you enjoyed this little flannel. Happy Valentine's! Kathryn at Fun with Friends at Storytime is hosting the Flannel Friday roundup today. You can also check out the FF website, Pinterest, or Facebook! Or use #flannelstorytime on Twitter!